US researchers have accurately measured the abundance of oxygen in a distant galaxy for the first time. The galaxy, COSMOS-1908, is 12 billion light years away from the Milky Way, and was found to contain around 20% of the oxygen observed in our sun. 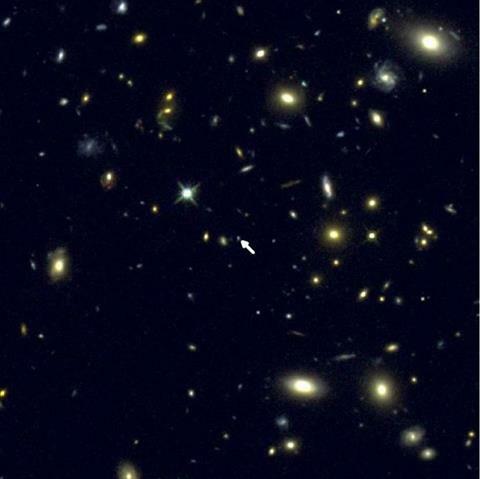 The measurements provide a snapshot of what COSMOS-1908 was like 12 billion years ago, and the researchers, led by a group at the University of California, Los Angeles, say they may provide important insights into the early evolution of galaxies when the universe was relatively young. They suspect the oxygen and other gases propelled to and from the intergalactic medium by ‘super winds’ play an important role in the process, as well as oxygen spewed out by dying stars. The measurements were made using the Multi-Object Spectrometer for Infra-Red Exploration (MOSFIRE) instrument at the Keck Observatory at Mauna Kea in Hawaii, which is capable of detecting light from very distant sources. Previously, direct measurements of elemental abundances have only been possible for closer, much brighter, galaxies. The team behind the COSMOS-1908 measurements hope it will now be possible to investigate other far off galaxies.